We seek to promote reasonable guidelines for personal cultivation of cannabis consistent with California law, and prohibit commercial cannabis activity in Plumas County. 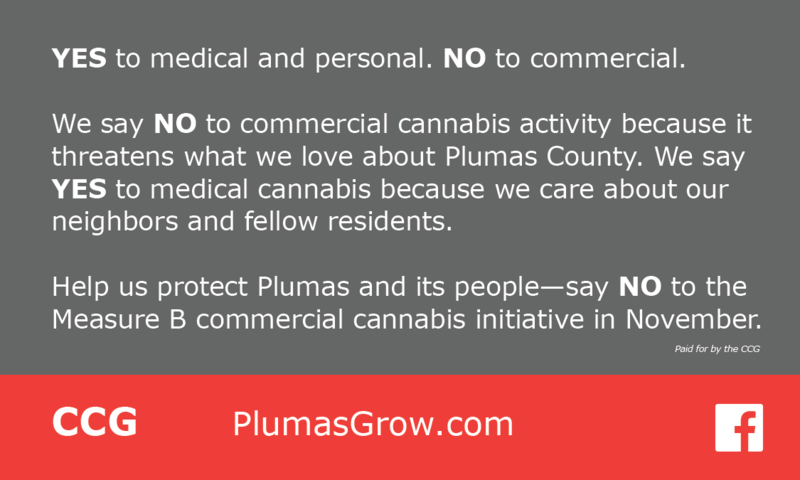 The purpose of the CCG ordinance is to provide a means for regulating the cultivation of cannabis in a manner that is consistent with state law and which balances the interests of persons choosing to cultivate and use cannabis while promoting the health, safety, and welfare of the residents and businesses within Plumas County. Health and wellbeing of our homes and communities. Public safety for all—growers and non-growers alike. Protection of our surrounding natural environment including wildlife and watersheds. Positive future for Plumas County with the normative culture of cannabis and cultivation. Defeat the Measure B MAUCO commercial cannabis ballot initiative in November. Prohibit the cultivation of cannabis in connection with any commercial cannabis activity. Cap the number of cannabis plants on any premises to six, regardless of the number of persons residing at the premises. Prohibit the cultivation of cannabis on any lot without a permanent, permitted residence. We are a diverse group of residents from all walks of life. We’re taking action because of grave concerns with the Measure B ballot initiative for the MAUCO pro-commercial cannabis proposed ordinance. While researching the ordinances of other California counties and their outcomes, we began meeting together to talk about our concerns, what we would like to see that wasn’t being addressed by the CWG, and what we were hearing from our neighbors. Together, we drafted an ordinance similar to Tehama County’s cannabis cultivation ordinance and have asked the Planning Commission to review it. Before their February meetings, we ask all of you for your feedback on our draft. We’d like to know where you stand and what concerns you may have with it. Is it too strict? Does it go far enough? We will revise our draft based on your input to ensure it meets the greater consensus of Plumas County residents, businesses, and government entities. We will then present our revised draft at the first Planning Commission meeting. We want to hear from you! Please look over our draft ordinance here, and give us your feedback. If you like what you read, become a supporter here. Thank you for providing a platform to discuss this issue with your group. I feel strongly that there has to be a way to bridge the gap in understanding between the differing viewpoints; I feel this starts with information based discourse. I understand that it is the CGRCO’s belief that “it would be prudent to start with a more restrictive ordinance, then, if circumstances dictate, loosen it”, I can see some wisdom in that, from a legal stand point once you say yes it is much more difficult to then say no, if need be. I understand why the CGRCO would want to take this approach with commercial cannabis, but please consider that in regard to medical and recreational cannabis that the opposite condition exists, we’ve already been told yes to expanded personal rights. The people of Plumas County have already decided what we want for our county and won through a democratic process. The majority of Plumas county residents voted for prop 64, and while not everyone that voted for prop 64 was voting for commercial, per se, 100% of the people who voted for prop 64 were voting for expanded personal and medical freedoms. To now attempt to restrict those personal rights is to go against the will of the people. I wonder if any consideration was given to this when writing the CGRCO proposed ordinance, even if only from a strategic standpoint. Ethical implications aside, if the goal is to gain the support of the community to endorse your ordinance, ignoring the will of the majority of voters is likely going to be an ineffective means to accomplish this goal. The requirement, by the CGRCO, for personal and medical cannabis to be grown, only indoor in a separate structure, while possibly well intentioned, would cost far more than most in Plumas County can afford. Given the prohibitive cost to comply, this essentially equates to a de-facto ban. I am aware of the waiver process, administered by the Plumas County Planning Department, which allows exceptions to be made on a case-by-case basis to allow indoor cultivation inside a residence. Nevertheless, unless a waiver is available for every Plumas county resident who voted for prop 64 and said waiver also allows for outdoor growing, then the CGRCO’s proposed ordinance continues to represent an expressed disregard for the will of Plumas County voters with respect to personal and medical cannabis. This ordinance is based on Tehama county’s cannabis ordinance, Tehama’s ordinance also contains a zero outdoor grow restriction. It has been an ongoing legal battle for Tehama County; recently, a group called the CRC has created their own ordinance and has told their board of supervisors they plan to file an initiative that will place it on the June ballot. Who knows how that will go, but it’s a mess, and it would be safe to say that Tehama’s ordinance is not going well for them. I’m optimistic that we can do better and without as much divisiveness and vitriol (or litigation). because of these values, I am concerned about the CGRCO’s goal to “End the outdoor cultivation of cannabis in any amount or quantity”. This goal is in direct conflict with CGRCO’s proclaimed value, the “Protection of our surrounding natural environment”. I wonder if you are aware of the huge impact banning outdoor growing would have on the environment? I would encourage you to research how much electricity is required to grow cannabis indoors. The estimates I’ve found for electrical consumption, range from the equivalent energy consumed by anywhere from 11 to 29 refrigerators per year, per grow. Eleven refrigerators consume 7,227 kWh of electricity per year according to energy.gov. We are surrounded by hydroelectric dams in Plumas county, hydro dams don’t release hydrocarbons to produce electricity; given our proximity it would be logical to think that the electricity that we consume in Plumas County would be likewise free of hydrocarbons. However, the electrical grid that we are connected to is, well a grid, our electricity comes from many sources, primarily gas (62.5%) https://oaspub.epa.gov/powpro/ept_pack.charts . If you live in Quincy and consume 7,227 kWh of electricity from PG&E, 4,306 pounds of carbon dioxide were released to produce that power, that’s equivalent to 220 gallons of gasoline or 2,137 pounds of coal burned, it would take over 50 trees planted as seedlings then grown out for ten years to offset the carbon foot print of one year of indoor cultivation for one person. Fifteen percent of California residents claim to use cannabis, if we apply that to Plumas county’s roughly 20,000 residents we arrive at 3,000 people, even if one tenth of those people grow their own, it becomes apparent how huge of an impact this decision would have on the environment. It doesn’t seem logical to consume the equivalent 4.5 barrels of petroleum to mimic something we have in abundance here in Plumas County, the sun, and using it produces zero carbon emissions. On the issue of the environment, the most common comment from members of the CGRCO both at public meetings, and on this site is how harmful cannabis is to the environment, specifically the water table. There are three things that need to be addressed concerning this belief. 1)	This belief is based on information gained from law enforcement, primarily from large illegal grows, many of them on public land. This information is accurate, there are people doing terrible things to the environment in an effort to grow cannabis, primarily for the illegal market. The people who grow in this way don’t care about cannabis and they are no friend of the greater cannabis community. Nonetheless, this practice is in no way the norm and cannabis growth is not synonymous with the use, or overuse, of chemicals. In addition, cannabis does not have any higher requirements in terms of fertilization than an average garden plant, this is a misconception and it is only when grown indoors that cannabis requires more fungicides and pesticides. Traditionally cannabis is grown using: compost, egg shells, alfalfa meal, kelp meal, banana peels, and manure. When grown outdoor pesticides and fungicides are normally not needed, but if needed Neem oil https://en.wikipedia.org/wiki/Neem_oil is commonly used. Neem oil is both harmless to the environment and is a highly effective against insects and fungal issues. Another common and effective remedy for fungal issues is the use of milk at a 10:1 ratio (10 parts water 1 part milk). Because of the potential for gains, most outdoor growers are obsessed with soil health; this in direct contrast to illegal grows on public land. The reason that illegal grows on public land are so destructive, in simple terms, is because their business model relies on not having an investment in the land. For people who are growing on their own land, as is the case with legal cultivation, the success of their crops is 100% dependent on the long term health of the soil and the health of the local water table. No-till farming is very popular amongst cannabis growers; it is a method of growing which actually improves the soil over time, https://www.sunset.com/garden/garden-basics/no-till-gardening . 2)	I’ve noticed the quote “enough water to make a tree cry” being used by the CRGCO to describe how much water a cannabis plant consumes. Aside from not being a quantifiable unit of measurement, “enough water to make a tree cry”, Is incorrect. A large, healthy productive outdoor plant consumes two gallons, per plant, per day. For comparison a mature pine tree can consume 100 gallons per day. According to UNL Beef, https://beef.unl.edu/amountwatercowsdrink a cow drinks 3 to 30 gallons per day depending on age, body size (weight), and stage of production. Don’t get me wrong I love beef, but if you are really concerned with water use in agriculture, objectively speaking cannabis consumes far less water than existing agricultural industries in this county. 3)	The fact that there are unscrupulous individuals, who are willing to poison the environment to grow cannabis, to me, only highlights the need for a legally regulated market so that responsible people can make an informed choice to buy from those who grow in an ethical way. The primary reason these individuals continue to stay in business is because of the public’s lack of access to an appropriate regulated source. To this end, I am confused as to why your group would not endorse regulation if you are as concerned about the environment as members repeatedly assert. In the Salinas area, growers are dealing with concerns that the large amounts of herbicides, pesticides, and fungicides that are used on the food crops in the area will be sucked into the intake fans of greenhouses, which could cause their crops to fail testing. People are worried that proximity to our food crops, even in a greenhouse, could expose cannabis crops to levels of toxic chemicals not allowable under prop 64. Under prop 64, legal commercial cannabis has more stringent environmental regulations than are applied to other agricultural products. In all of the material that you provide on The “Plumas Grow” web site for education, there is not one link to prop 64, this seems like a huge oversite. This lack of information and the prevalence of misinformation is echoed over and over again in the comments and question expressed by members of your group. It is abundantly clear that the majority of the people that speak on behalf of the CGRCO have never read prop 64, because the vast majority of questions asked could easily be answered by simply reading this bill. Greater familiarity with prop 64 would help your cause and would allow for more substantive discussion with community members. I hope, in earnest, that we can maintain an ongoing dialog, there is much more on this issue to discuss. P.S. I’ve included several links in this post to reference my sources; it appears that external links are not enabled in the comments section. To reference my sources it may be necessary to highlight the addresses, and search google. Thank-you for a well written letter. I believe that you are correct in your assessment of the public desire to pass laws that ease both access and personal use of marijuana. California citizens would otherwise not have decriminalized it’s use. Your data for Plumas users does not match that of the Sheriff’s department. This spring the number of medical marijuana 215 script or cardholders in the county had grown to 1280, or 8.5% the adult population of 15,000. And most people I know who use cannibas, acquired “scripts” and are not daily users. They may smoke an ounce a month. High School and College administrators in the county say that it is easier for minors to get “bud” than cigarettes. We do not foresee a time when people will be unable to get the product they desire or require. What you are missing is that our opposition to commercial activity is primarily cultural. A good number of CGRCO supporters are users, but they do not want our county to become a center for cannabis production and distribution. Absent local ordinances, dozens of local people have become growers and a wave of outsiders are buying land and planting. Growers that I have interviewed on “The Common Good,” speak about their product as medicine, but we have done the Math and its is all about dollars. The Moratorium was a first step for us, and we will press forward to see its intent codified in local ordinance. We do not need to have a lawyerly grasp of 215 or 64 to know that Cannibas plantations are the greatest threat to our quality of life that we face today. Thank you for taking the time to respond to my concerns. Also, thank you for providing real numbers in regard to medical cannabis users. Twelve thousand eighty is surprisingly close to my estimate and when you factor in recreational growers, the number is actually likely higher than my estimate of 3000.This helps to validate the point I am making, concerning the environmental impact of an outdoor ban. I would like to see a diversion in the cash stream from the illegal market, to the taxed regulated market. I think this would be in the best interest of public safety and while it won’t solve all of our financial problems, it could help us take a step towards economic solvency. It may not be clear from my statements, but I do, share your concern over the cultural image of the county. Despite the impression I may have given from my advocacy for access to legal cannabis, I would like to see a cautious approach taken concerning commercial cannabis; a few small, tightly regulated farms and a dispensary or two is what I believe to be in the best interest of the public. I too, do not want our county to become a center for cannabis production. My primary concerns are medical and personal, and then safe responsible access for those who cannot grow their own. “We do not need to have a lawyerly grasp of 215 or 64 to know that Cannibas plantations are the greatest threat to our quality of life that we face today.” I’m genuinely surprised by the breadth of this statement. I would also contend that having a grasp of props 215 and 64, is the difference between appearing as if you understand the subject at hand, or not. Demonstrating an understanding of a subject is directly proportional to how seriously people take your opinion on that subject. If a group formed, whose primary purpose was to refute the validity of the CGRCO’s beliefs, but members openly state that they do not need to fully understand the ordinance to know that the CGRCO is “the greatest threat to our quality of life that we face today”. Wouldn’t you see that as short sighted, if not grossly irresponsible? I think anyone would take offence to someone who was willfully ignorant to your beliefs, while simultaneously making it their personal mission to prevent you from the right to them. *Edit, third line should read:Twelve hundred eighty, when you factor in recreational growers, would bring us surprisingly close, to my estimate of 3000, likely higher. “Your message was the only return response I have received to date. It was measured and kind, which anyone would appreciate (and I do). It is difficult to thread the needle, but we are trying. How we finalize our ordinance proposal has a lot to do with what the state might do. Some of our members have repeatedly pointed out that starting with a heavier hand makes it easier to loosen the grip later instead of the reverse condition of treading lightly at first and then needing to tighten. That second path would feel more like “bait and switch” to growers. Some counties (like Calaveras) are in this bind right now. So let’s dream a bit. I wish there was a way to inject legal banking of cash and checks into this segment of the economy. I wish there was a way to provide online ordering/payment and delivery of the product to your door. And I wish there was a way to ensure that every medical user’s Prop. 215 card was issued by a legitimate physician, long acquainted with the patient. Admittedly, that’s a lot of wishing. Until some of these details (or answers to my wishes) were granted, we are performing surgery in the dark, in advance of the full diagnosis. As you correctly pointed out, the needs of the medical user and their rights granted under all California marijuana laws should be protected, including their access to marijuana. My best guess is that we will be wrestling with all of these issues during the future Planning Commission process of deliberation. Again, threading the needle of local access while preventing large-scale commercial grows based on exportation to locations outside the county is not easy. The big grows ask us to accept any and all problems, damage, and unwanted results while they enjoy high profits and tax-free banking offshore. That’s an unbalanced equation that upcoming state regs may solve for us (or not). The statewide vote favoring passage of Prop.64 is what matters here, not an individual county’s vote. Regardless of the funding source, I would concede that the statewide vote was an exercise in democracy, even though the pro-64 campaign outspent the no-64 effort by 12-to-1. Based on the large corporate investments in most things cannabis within the last five years, I’m betting a smaller portion of this campaign cash came from individuals than from large business interests. (Without any proof) I am of the opinion that many or most pro-64 voters made that choice resulting from a desire to de-criminalize marijuana’s use or possession, not to take some kind of stand about cultivation, distribution, purchase, or the size of commercial operations in their communities. Why would it be otherwise since Prop. 64 gave 58 individual counties the first bite of the regulatory apple? Personal and medical freedom have always been with us in terms of marijuana. This includes going out and breaking existing law, which users and growers have done for years in varying degrees. Even if “in the shadows,” marijuana has been accessible for decades. Until Plumas adopts an ordinance, all growing exceeding six plants at an occupied residence for recreation or medical consumption remains illegal. The local moratorium on commercial cannabis will extend either until an ordinance is adopted or the moratorium expires in October, 2019 (with state rules taking hold after that if no local ordinance is adopted). I agree with your assertion that too much restriction on “backyard buildings” for growing constitute excessive complication and cost than should be required, and that can constitute a de-facto ban for most. As I wrote you previously, CGRCO is aware of this. At our January 3rd meeting we resumed wrestling with this requirement and are working toward modifications. We also discussed the likelihood that many might not want to grow their own, and we’re thinking about a dependable delivery mechanism from outside Plumas rather than local dispensaries to serve our over-21 customers. More research is needed, but we think this path is legally possible and more desirable than living with too many dispensaries or rationing them, only to face resulting lawsuits over business discrimination. You’ve made an attempt at extrapolation of carbon emissions resulting from the electricity needs of an indoor grower. In terms of climate change, it doesn’t matter where the greenhouse gases originate, only that they reach a constantly mixing atmosphere. But contrasting that truth, your kilowatthour to carbon emission math missed California’s current energy reality. We are ahead of schedule in meeting a 33% renewable electricity target by 2020, and 50% by 2030. By policy, neither of these targets credits the state’s drought-mercurial contribution via large scale hydro, and legislation has been introduced to convert the 2030 target to 80% renewable. When talking carbon emissions, the lowest hanging fruit has already dropped to the ground; we only have to pick it up. Transportation in California accounts for over 70% of our carbon emissions and either fuel-celled or battery-electric vehicles are the path to make the largest reduction in a cultural conversion to what is being called “beneficial electrification.” Battery electric vehicles are increasing, two major manufacturers have already produced Class 8 truck prototypes powered by electricity, and railroad locomotives (in some applications) are on the horizon. I think the point where our preferences currently differ on cannabis is illustrated by your comment that unscrupulous individuals will be eliminated by a locally legalized commercial cultivation market. You claim that our public will overwhelmingly prefer purchasing from legal, ethical growers. I think such purchases will hinge more on price, and no legal grower will be able to match the low prices of illegal cartels or private land owners who violate celebrated environmental norms. Because of equal treatment and opportunity for legal growers within a permissive ordinance, the door would remain open for the unscrupulous, and the resulting environmental and social costs won’t be offset in tax revenue or paid via revenue from consumer purchases. Cartel grows are not going away under current policies and enforcement resources. I, too, appreciate the opportunity to engage in dialog that displays where all is coming from. To repeat the phrase I’ve used before, we are trying to “thread the needle of regulation” to honor our state’s laws, our county’s opportunity to regulate, and the rights of our citizens. Thank you for your response; also I very much appreciated your reply on 12/21/17. I did want to reply, but I didn’t want to come off as a troll, this thread appeared to be a more centralized introduction to the group as a whole, so I thought this might be a more appropriate place to comment. I am glad to hear from you again, you appear to be a voice of reason on this subject. It seems as though some positive progress is being made by the CGRCO based on your reply; this is encouraging to me. Thank you for including the link in your first reply, I had read that article a few days prior to our discussion. Personally, I feel that it was a mistake on the part of state law makers to allow any commercial growing in 2017. It created a legal grey area that ultimately didn’t benefit anyone; I’m really not sure why it was handled in this way. To me the article highlights how this transition could have been handled better. I hope, that articles like this increase social awareness about unnecessary growing practices, this is one of the primary reasons I advocate for legalization. During alcohol prohibition, people died from drinking toxic bootleg alcohol. If the production of a commercial product is left up to the general public, with no regulation, the potential for public safety issues increases. I am encouraged that legalization will allow folks to choose to support safe, environmentally responsible growing practices. I actually don’t think that legalization will eliminate the black market, but it will reduce it. Every dollar spent in the legal market is a victory; it represents safer environmental practices, and tax revenue that would not have been collected otherwise. Legalization won’t stop the black market, but it will do more to reduce it than CGRCO ordinance would, as far as I can determine. Correct me if I’m wrong, but there really is nothing in the CGRCO ordinance that would specifically address the cartel activity in the county. Reducing cartel grows in Plumas is important to me, because, as annoying as some legal commercial growers may seem, a guaranty that the people growing in our forests are objectively much worse. These are scary people, operating completely outside of the law with nothing to lose. I feel that some in the CGRCO are focused on the people who choose to operate openly in the public eye, simply because they choose to operate in the public eye. I do understand how a rapid increase in visible grow activity, could make some people, who are still not comfortable with cannabis anxious. However, it’s not the people who are willing to show you what they are doing, that you should be worried about. I don’t want a “permissive” ordinance; I want reasonable control over an activity that will happen regardless of legality. What I meant specifically, when I referred to unscrupulous individuals, is people who use poisons and toxic chemicals to grow, and have no regard for the land they grow on. Prop 64 addresses my concerns in this area, the CGRCO proposed ordinance doesn’t address this in any way at this point, and yet purports to have been conceived to “Protect our surrounding natural environment including wildlife and watersheds.” At this point I’m having a hard time figuring out, in what way, this proposed ordinance would actually accomplish this. I believe in the concept of voting with your dollar; legal cannabis has stringent environmental regulations applied, black market cannabis does not. Access to legal cannabis would be more difficult under the CGRCO ordinance; I think we all can agree that this is the case. If it’s more difficult to buy legal cannabis, then due to lack of access to an alternative source, it stands to reason that an increased consumption of black market cannabis would likely then be a result. The byproduct of your ordinance is then an increase in the market share of illegal cannabis. Coupled with the environmental impact of an outdoor ban, it stands to reason that the CGRCO ordinance could then have a negative impact environmentally. I don’t think this was what was intended by the CGRCO. My extrapolation of carbon emissions is 100% accurate as per “California’s current energy reality”. I’m assuming the CGRCO would like the county to adopt the CGRCO’s ordinance as soon as possible, as in immediately. As such if we are to be accurate about the impact this ordinance would have on us right now then we need to use info for right now. I like speculating about the future of electric cars and such too, but I would prefer if my concerns on this issue were not glossed over. The subject at hand is the environmental impact of a CGRCO outdoor cultivation ban. The end result of this ordinance would be destructive to the environment, which is inconsistent the CGRCO’s message. I am glad to hear that there has been talk, about the cost of a detached building indoor only requirement; I sincerely hope that the environmental cost of indoor cultivation is factored into these talks. “The resulting environmental and social costs won’t be offset in tax revenue or paid via revenue from consumer purchases.” I am confused by this statement, because in a very real way social and environmental costs would be offset, through prevention, using tax revenue from cannabis purchases. Maybe I’m missing something in the original meaning of this comment, would you be willing to explain what you mean? I don’t want to put words in your mouth. As far as people’s motivation when voting for prop 64 is concerned, I agree that not everyone who voted for prop 64 did so to take a stand for commercial cultivation. But, I have never met someone who consumed cannabis, but thought that people shouldn’t be allowed to grow six plants, on their own property, out of public view. People who consume cannabis recreationally view cannabis as relatively benign; a cannabis consumer does not see a cannabis plant as a danger to society. I’m sure they exist, but I think you would be hard pressed to find a cannabis consumer who doesn’t believe that people should have the right to grow their own. I have met many people who grew, and support personal, but didn’t vote for prop 64 because they didn’t want commercial. Almost everyone supports personal, the percentage of people who support personal cultivation, is much higher than the percent of people who voted for prop 64 in my opinion, based on my personal experience with growers. I have always believed that politics should not get between friends, relatives, or neighbors. Since we are all neighbors here, please let me know if the level of discourse ever becomes unproductive. I respect your right to your views, thank you for listening to mine.